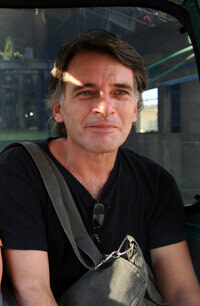 Marc Mercier is the artistic director of the digital and poetic Instants Vidéo since its establishment in 1988. Marc Mercier kept in mind a valuable lesson from the history of video art: it is a lifestyle. A poet, a film director, a sower, and a gold digger in a “poelitic” mine. He writes for the newspaper, les Acharnistes, the Incidences magazines, Bref, 24 images et Il Particolare. He is the artistic director of Instants Vidéo since its foundation in 1988. He is also the co-founder of the video art festival in Casablanca in 1993 and of the VidéoAsis in the Moroccan desert of Figuig in 1997. In 2006, he published a story from the video Art : Le temps à l’œuvre, f(r)iction. Marc Mercier actually lives in Marseille. He dreams of a liberated Palestine as well as of a sovereign Lebanon. A so-called Poetic Revolution. A revolution starting from the free movement of the individuals, of the birds till the one of the ideas and the kisses. He adores Gianni Toti, the sound of the rain (in the evening), the boxer-poet Arthur Cravan, wine, sparkling eyes and freedom.